The Swiss delegation consisting of Émilie Hertig, Eric Schertenleib (teamleader), Zara Vance, Daniel Keller (independent juror), Joonas Vättö, Kathrin Laxhuber, Marc Bitterli (captain), Patrick Lenggenhager (teamleader juror) und Samuel Byland (EC) wins a gold medal at the IYPT 2016 in Ekaterinburg, Russia. The Swiss team (Kathrin Laxhuber, Joonas Vättö, Marc Bitterli (captain), Zara Vance and Émilie Hertig) is ready for the final of the IYPT 2016 in Ekaterinburg, Russia. In the background the coaches are encouraging the team: Samuel Byland (EC) Patrick Lenggenhager (teamleader juror) and Eric Schertenleib (teamleader). A very nice reception was awaiting the Swiss delegation after their success at the IYPT 2016 in Russia. The Swiss delegation consisting of Daniel Keller (independent juror), Samuel Byland (EC), Eric Schertenleib (teamleader), Joonas Vättö, Marc Bitterli (captain), Émilie Hertig, Zara Vance, Kathrin Laxhuber and Patrick Lenggenhager (teamleader juror) at the airport in Zurich after winning a gold medal at the IYPT 2016 in Ekaterinburg, Russia. The Swiss team 2016: Zara Vance, Joonas Vättö, Émilie Hertig, Marc Bitterli (captain) and Kathrin Laxhuber. The Swiss team consisting of Marc Bitterli (captain), Émilie Hertig, Kathrin Laxhuber, Zara Vance and Joonas Vättö with the coaches Samuel Byland (EC), Daniel Keller (juror), Patrick Lenggenhager (teamleader juror) and Eric Schertenleib (teamleader) made the way to the final of the IYPT 2016 in Ekaterinburg, Russia. After a solid start and an excellent performance in the final, in which Singapore, Germany and Chinese Taipei participated, Switzlerland placed third. Congratulations! Mehr information can be found in the category IYPT 2016. 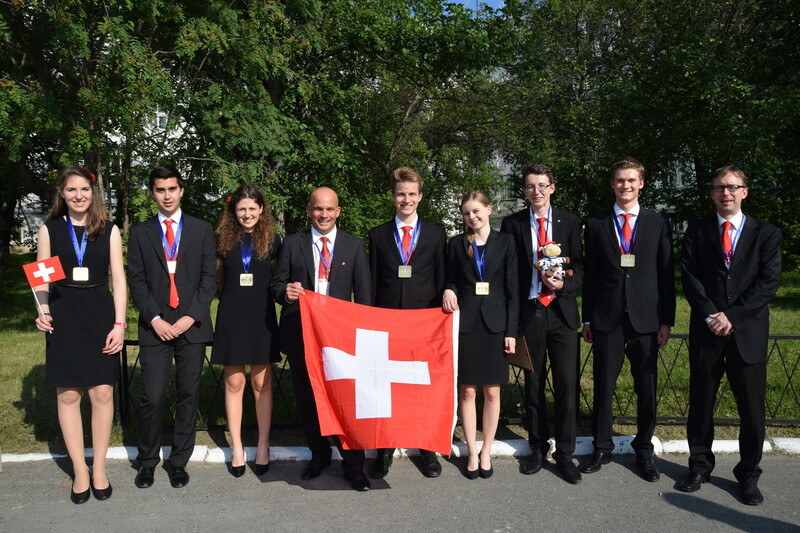 The Swiss team wins a gold medal: Émilie Hertig, Eric Schertenleib (teamleader), Zara Vance, Daniel Keller (independent juror), Joonas Vättö, Kathrin Laxhuber, Marc Bitterli (captain), Patrick Lenggenhager (teamleader juror) and Samuel Byland (EC). Copyright © 2019 SYPT.ch. All Rights Reserved. Designed by JoomlArt.com. Joomla! is Free Software released under the GNU General Public License.